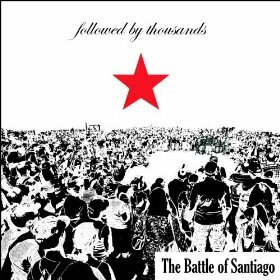 Followed By Thousands, the latest release from the Toronto-based band The Battle of Santiago, marks a step forward in the consolidation of this band’s multicultural sound. Grounded in jazz, electronic and Afro-Caribbean musical traditions, as well as in contemporary approaches towards interactive multimedia art and theater, The Battle of Santiago honors the polemic events that occurred during the soccer World Cup of 1962 in Chile, where in a match full of violence and body contact that came to be known by that name, Chile beat Italy two to zero. Founded by bassist Michael Owens, this band also includes three Latin percussionists, a saxophonist/flutist, and a guitarist/sound manipulator in a musical set-up that they define as Afro-Cuban-Post-Rock. This new album is more charged towards the rave side of music than towards the more electro-Latin-jazz ideas that were included in their first album Full Colour, therefore making it more suitable for a party environment, where dancing would be the more reasonable reaction to this music. Followed By Thousands is a balanced blend of atmospheric sounds, jazz solos and harmonies, Latin percussion beats and improvisations, and electronic backgrounds and sounds, all of which provide a steady backing groove that will make you tap your foot. On the group’s website you can listen to a full version of the album, as well as to their previous releases! Reviewed by Juan Sebastián Rojas E.
This entry was posted in Latin, World Music and tagged Afro-Cuban Post-Rock, Canadian Music, Followed By Thousands, Latin Music, Made With Pencil Crayons, The Battle of Santiago, Toronto by aaamc. Bookmark the permalink.